Sheer luxury surrounded by views of the mountains! That’s the best way to describe these one-of-a-kind properties. Nestled on a quiet street in one of Mt. 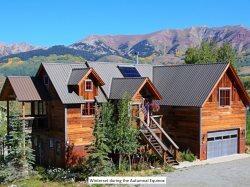 Crested Butte’s most prestigious neighborhoods, Elk Run represents the perfect vacation getaway. The main home is a 3 bedroom, 3.5 bath property and the guest house is a 1 bedroom, 1.5 bath home. The are side by side and only 100 yards from the Homeowner's ski trail…offering easy access to some of the best skiing and outdoor recreation that Crested Butte has to offer! The main home recently underwent a complete renovation...inside and out and the guest home is brand new! The unique characteristics of the transformation include stacked rock walls, designer finishes and furnishings, and top of the line appliances. The first floor includes 2 bedrooms, each with their own bath; the first with 1 bunk bed (twin over queen) and an additional twin bed, and the second room with a queen. The master, on the top floor of the home, is a private oasis complete with vaulted ceilings, a king bed, and an en-suite bath that includes double sinks, stand alone soaking tub and a steam shower. The BRAND NEW guest home features high end finishes, two decks, a wood burning fireplace, deep soaking tub, king size bed and steam shower. The main level of the main home takes your breath away with an open living, dining, and kitchen area. Sit back and relax by the large rock fireplace, enjoy your favorite program on the oversized flat screen TV, or chef it up in the gourmet kitchen suited for the most discerning of cooks! Enjoy your après ski snacks or drinks out on the deck that includes a long dining table with bench seating. Take in the 360 degree views of the mountains, or soak up the views in the 8-person hot tub. In the guest home, the state-of-the-art kitchen and living room are perfect for an evening of cooking and relaxing in the privacy of your own home. The deck off the living space with outdoor seating provides the perfect setting for a candle lit dinner, bathrobe coffee and breakfast, or cocktail hour. Set the mood with your favorite music from the SONOS sound bar, with separate sound in the living space and bedroom for added ambience. Then take in your own private views of Oh Be Joyful, Scarps Ridge, Snodgrass, Smith Hill & Meridian Lake. Whether you plan to spend your vacation skiing, biking, hiking, or just plain relaxing, you won't want to leave Elk Run! Small 10 lb dogs considered. Main House and Guest House can both be booked separately. Inquire for pricing. My family visited crested Butte for a getaway. The house was amazing! The view was fabulous and we loved sitting on the back porch! The whole family wants to stay there again! !